CLARION, Pa. – Nine District 9 basketball teams get their PIAA playoffs underway Saturday. Here is a look at the Saturday games. When and where: 7 p.m. Saturday, March 10, at St. Marys High School. About Coudersport: The Falcons won their second straight District 9 2A title in convincing fashion, 66-46, over Ridgway … Last year, Coudersport beat United in the opening round of the PIAA playoffs before losing to Greensburg Central Catholic … The Falcons have a pair of 1,000-point scorers in Jared Green (1,503) and Owen Chambers (1,387). Chambers leads Coudersport at 24.8 ppg with Green adding 17.2 ppg. Hunter Ricke adds 11.2 ppg and Derek Keglovits (7.7 ppg). About Wilmington: The Greyhounds, after a long run in football, started the year 3-7 but have gone 11-5 since including victories in six of their last eight games. Wilmington lost to West Middlesex in the D10 semifinals but beat Cochranton in the consolation game … A year ago, the Greyhounds were the D10 champions and advanced to the second round of the PIAA playoffs before losing to Bishop Canevin … Four players average in double digits led by Daniel Hansssen (13.2 ppg). Colton Richards adds 10.1 ppg, Robert Pontius 10.7 ppg and Isaiah Jarzab 10.0 ppg. Winner Gets: Winner of Our Lady of Sacred Heart (7-2)/Homer-Center (6-4) game. When and where: 5:30 p.m. Saturday, March 10, at St. Marys High School. About Ridgway: The Elkers were stunned in the D9 title game by Coudersport, 66-46, after winning their first 25 games. The 66 points allowed were a season-high for Ridgway, as the Elkers allow just 34.2 points per game … Ridgway was the third-place team out of D9 a year ago and went to the Elite Eight on the strengths of wins over North Penn-Mansfield, 54-50, and Berlin Brothersvalley before running into Philadelphia powerhouse Constitution in the round of eight … Neil MacDonald leads the Elkers at 11.7 ppg, Johnny Mitchell adds 10.3 ppg, Andy Breier 10.1 ppg and Daunte Allegretto 7.6 ppg. About North Penn-Mansfield: The Tigers took the hard way into the PIAA Tournament after losing in the District 4 semifinals to Muncy, 69-50. First, they had to beat Wyalusing Valley, 43-41, in the consolation game and then they had to go on the road Tuesday and play District 5 third-place finisher North Star, at North Star, where they came home a 72-59 winner. North Penn-Mansfield is just 6-5 in its last 11 games …. Dylan Meyer leads the Tigers at 12.1 ppg and 9.7 rpg. Garrett David adds 11.6 ppg and 7.6 rpg while Nick Kasper checks in at 10.9 ppg and Brent Burleigh at 9.4 ppg. Winner Gets: Defending state champion Sewickley Academy (7-1)/Cochranton (10-4) winner. When and where: 7 p.m. Saturday, March 10, at Hollidaysburg High School. About Brockway: For the second straight season the Rovers entered the D9 playoffs as the sixth seed but have advanced to the PIAA playoffs. Brockway was second last year and lost to Bishop Canevin in the first round. 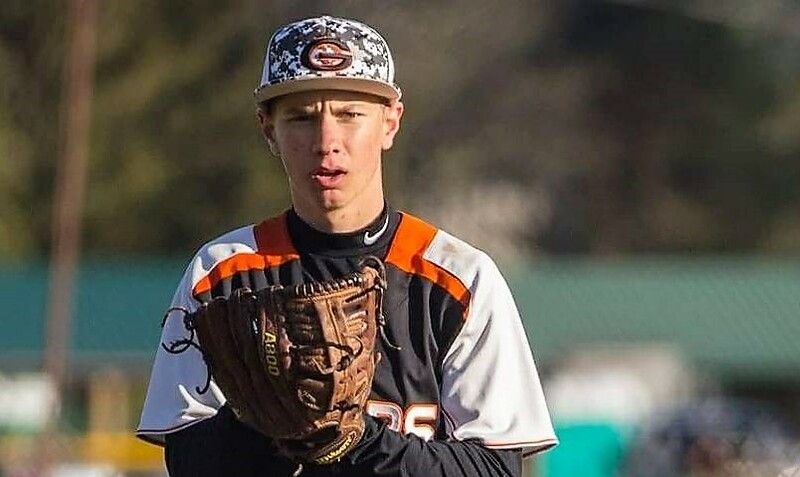 This year, the Rovers fell to Coudersport in the semifinals before knocking off Clarion in the consolation game to earn the PIAA berth … Carter Adams (15.2 ppg) leads Brockway with Noah Vokes (10.7 ppg) and Zane Puhala (8.7 ppg) also playing key roles. About Bishop GuilfoyleThe Marauders beat Purchase Line, 66-58, in the D6 title game a year after finishing second to Bishop McCort in District 6. 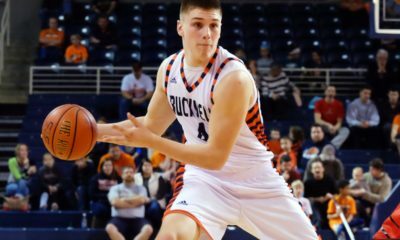 In 2017, BG went 1-1 in the PIAA playoffs beating McConnellsburg and losing to eventual state champion Sewickley Academy … Luke Ruggery, a junior who is committed to play at D1 St. Francis (Pa.) leads BG at 21.0 ppg. A.J. Labriola, a senior who is going to be a preferred walk-on at St. Francis (Pa.) adds 15.7 ppg, while Mike Scharf scores 10.7 ppg. Mark Conrad, a St. Francis (Pa.) football recruit, chips in 5.3 ppg. Ruggery, who has hit 100 3-pointers on the season, needs 16 points to reach 1,000 in his career. Winner Gets: Winner of Delco Christian (1-1)/Constitution (12-2) game on the eastern side of the bracket. When and where: 6 p.m. Saturday, March 10, at Keystone High School. 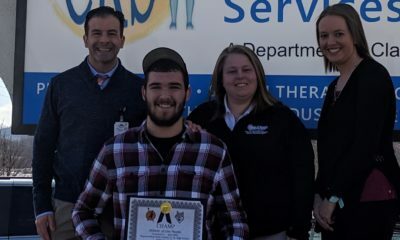 About Karns City: A young Gremlins team with just two senior starters won its second straight D9 title when Austin Fahlor hit a 3-pointer at the horn to beat Brookville, 34-31 … Last year, Karns City lost to Erie First Christian in the opening round of the PIAA playoffs … Freshman Chase Beighley, a first-team All-KSAC choice, leads Karns City at 13.3 ppg, but Beighley didn’t score in the D9 title game after being held to two points in Karns City’s loss to Clarion-Limestone in the KSAC Title game, the Gremlins last game before the D9 championship game. Beighley has just 11 points in his last three games. Fahlor, a junior, adds 11.6 ppg with senior Nolan Riley chips in 8.3 ppg and fellow senior Jacob Friel 7.4 ppg. Freshman Nathan Waltman adds 7.0 ppg. About Mercyhurst Prep: The Lakers are back in the PIAA playoffs for the first time since losing in the opening round of the 2015 2A tournament … Mercyhurst Prep reached the PIAAs this year by beating Sharpsville in the D10 consolation game after losing to Greenville in the semifinals … The Lakers enter the tournament having dropped 4 of 6 … Alex Miklinksi leads the way at 10.5 ppg, Jacob Brooks adds 9.1 ppg, Nick Byerly 8.8 and Griffin Herron 8.7 ppg. Winner Gets: Winner of Richland (6-2)/Aliquippa (7-3) game. When and where: 5:30 p.m. Saturday, March 10, at Clarion University’s Tippin Gym. 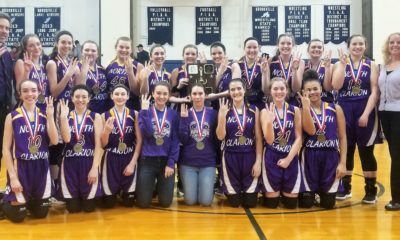 About North Clarion: The She-Wolves won their second straight District 9 title with a 52-49 win over A-C Valley … This is a rematch of a second-round win last year for North Clarion, which beat Cornell, 68-58, on its way to the Elite Eight, where it lost to Bishop Carroll … The She-Wolves are led by the best player in school history and one of the best players in D9 history in senior Tori Obenrader. Obenrader is second in D9 in both scoring (24.4 ppg) and rebounding (15.4 rpg) and is fifth all-time in D9 history with 2,072 career points while adding 1,538 career rebounds … Additional key players for North Clarion, which became only the second unbeaten D9 champion and the first in 1A on the girls’ side since at least 1996, are Abby Gatesman (10.4 ppg), Gabby Carll (5.2 ppg), Gabby Schmader (4.9 ppg) and Mackenzie Bauer (4.5 ppg). About Cornell: Not much is the same with the Lady Raiders from last year, as they have a new coach and the top players from the 2017 WPIAL runner-up team graduated. Cornell got to the PIAA playoffs by upsetting Avella, 44-40, in the first round of the WPIAL playoffs before falling to eventual champion Winchester Thurston, 53-17, in the second round and getting to the PIAA’s when WT won the title in the WPIAL’s follow-the-leader format … Some top players for the Lady Raiders include Cy’Moni Harrison, Nysia Miles and Patience Gipson. Miles had nine points in the game vs. North Clarion last year with Harrison scoring five and Gipson none. Winner Gets: Winner of the West Greene (7-2)/Farrell (10/2) game. When and where: 4 p.m. Saturday, March 10, at Keystone High School. About A-C Valley: The Lady Falcons are in the PIAA playoffs for the second straight year. Last year, they lost to Bishop Carroll, 73-32, as the third-place team out of D9 … Of A-C Valley’s six losses, five have come to district champions – three to D9 1A champ North Clarion, 1 to D9 4A champ Punxsutawney, 1 to D10 2A champ West Middlesex – with the other one coming to D9 3A runner-up Karns City … The school’s all-time leading scorer Ellie Thompson (1,485 career points) leads the way averaging 19.3 ppg. Kylee Eaton adds 9.3 ppg and Cami McNany 9.1 ppg. They have all taken their games up a notch since a midseason injury to point guard Olivia Boocks (9.8 ppg) that cost Boocks her season. Since then, Thompson is averaging 20.0 ppg, McNany 10.7 ppg and Eaton 10.3 ppg. Also raising their level of play since then are Annie Viertel (5.4 ppg) Brooke Irwin (5.1 ppg). On the year, Viertel averages 5.2 ppg and Irwin 4.2. About Sewickley Academy: The Lady Panthers got to the PIAA playoffs by getting a bye into the quarterfinals in the WPIAL postseason and beating Aquinas Academy, 42-35, before losing to eventual champion Winchester Thurston, 56-40, in the semifinals. Sewickley finished fifth in the WPIAL last year and lost a first-round PIAA game to North Clarion, 57-38 … Players to watch for the Lady Panthers, who have only one senior on the roster, include freshman Breanna Warner, who had nine points in the loss to Winchester Thurston as well as Kamryn Lightcap and Sam Smith, who each had eight points in that loss. Winner Gets: Winner of Kennedy Catholic (10-1)/Portage (6-3) game. When and where: 5:30 p.m. Saturday at Hollidaysburg High School. About Otto-Eldred: The Lady Terrors are making their second straight appearance in the PIAA Tournament after taking third in District 9. Last year, Otto-Eldred was the second-place team out of D9 and beat WPIAL third-place finisher West Greene, 61-57, in the first round before losing to Kennedy Catholic, 72-34, in the second round … This season, the Lady Terrors were beaten in the D9 semifinals by A-C Valley, 56-52, before rebounding to knock off Elk County Catholic in the consolation game, 54-48 … Three of O-E’s four losses have come since Jan. 31, as it enters the PIAA playoffs 5-3 in its past eight games … 1,000-point scorer Camryn Thomas (1,347) leads the way averaging 17 points and nine rebounds per game … Ali Cousins adds 11.4 ppg with Jade Spinney chipping in 5.4 ppg. About Juniata Valley: The Lady Hornets made a bit of a surprise run to the PIAA title game last year before losing to Lebanon Catholic, 55-43, in the title game after finishing second in District 6. They beat rival Bishop Carroll in the semifinals a year ago and then knocked off the Lady Huskies, 48-42, again in this year’s D6 title game. They have won 21 of 22 entering the PIAA playoffs … Sophomore Halee Smith leads JV at 16.1 points and 7.0 rebounds per game. Sydney Reed, who is 72 of 161 from 3-point range, adds 13.7 ppg, while another sophomore Hayden Taylor, chips in 10.4 ppg with Maddie Mattas scoring 9.8 ppg and Taylor Leidy 8.5 ppg … The Lady Hornets are a tall squad with three starters at 5-foot-10 or better led by Mattas at 6-foot. They also have two 5-foot-11 players coming off the bench. Winner Gets: Winner of Berlin Brothersvalley (5-1)/Quigley Catholic (7-4) game. When and where: 3 p.m. Saturday, March 10, at Cannon-McMillan High School. About ECC: It has been a streaky season for the Lady Crusaders who started the season 6-4 before rolling off five wins in six games then three of four before winning before winning three in a row. But they enter the PIAA playoffs having lost 3 of 4 including in the D9 semifinals to North Clarion and the consolation game to Otto-Eldred as well as in the AML Title game to Kane … ECC is back in the PIAA playoffs after missing the field last year … Sophomore Taylor Newton leads the way averaging 14.3 ppg. 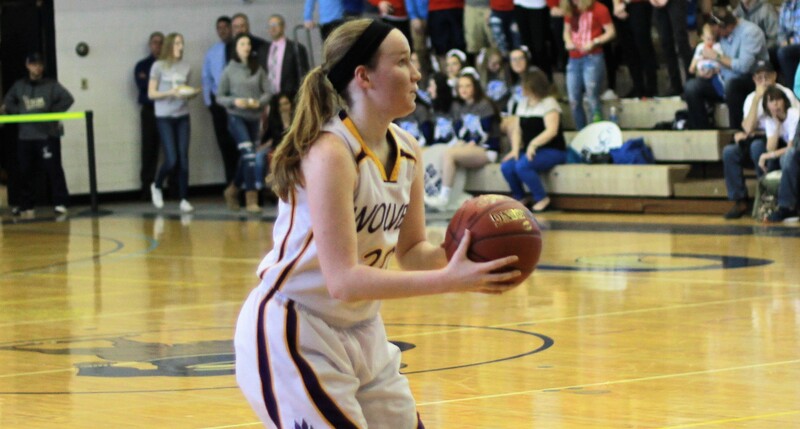 Josie Smith chips in 9.7 ppg, but no other Lady Crusaders averages 5.0 ppg or more. About Winchester Thurston: The Lady Bears won the WPIAL title with a 76-57 win over West Greene and enter the PIAA playoffs having won 11 of 12. It was the second straight WPIAL title for Winchester Thurston, which beat Northern Potter, 55-24, in the first round of last year’s PIAA playoffs before being upset by Juniata Valley, 43-28, in the second round … A pair of 1,000-point scorers and Division I recruits lead the way for the Lady Bears. Ayanna Townsend, a 6-2 senior center, is headed to Xavier. She averages 14.8 ppg. Gia Thorpe, who is getting Ivy League interest, is the leading scorer at 21.3 ppg and had 36 points, 14 rebounds and 10 steals in the WPIAL title game win over West Greene. Thorpe was a transfer into WT last year. Winner Gets: Winner of Bishop Carroll (6-2)/Shanksville (5-2) game. When and where: 4 p.m. at Clarion University’s Tippin Gym. About Punxsutawney: The Lady Chucks won their fourth straight D9 title (2 in 3A and 2 in 4A) and are making their fourth consecutive PIAA appearance. Last year, Punxsy beat Central Valley in the first round, 46-40, before losing to Cardinal Wuerl North Catholic … Punxsutawney is led by 1,000-point scorer, 1,000-point rebounder. 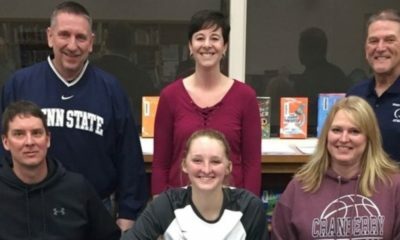 Miller, who didn’t play varsity as a freshman, has 1,030 career points and is averaging 15.7 points and 16.2 rebounds per game this season … Addition key players for the Lady Chucks include Kate Horner (12.0 ppg), Sarah Weaver (7.7 ppg) and Riley Presloid (5.4 ppg) … Punxsutawney defeated St. Marys in the D9 title game. About Ambridge: The Bridgers suffered a tough loss to Cardinal Wuerl North Catholic, 49-42, in the WPIAL quarterfinals Feb. 22 after beating South Park, 48-39, in the first round … Ambridge is back in the PIAA playoffs after a year away … Ambridge could be boosted by the return of 6-foot-1 junior Aniya Walker, who missed over a month due to a sprained ankle but played a few minutes in the WPIAL playoffs. She has seven Division I scholarship offers including from Duquesne and Youngstown State. Her dad, Myron Walker, was a star at Aliquippa and Robert Morris and is the all-time leading scorer in Robert Morris men’s basketball history with 1,965 career points … Additional key players for Ambridge include Dasha Jackson, Kara Haslett and Chloe Rabold. Winner Gets: Winner of Cardinal Wuerl North Catholic (7-1)/Keystone Oaks (7-7) game. March 9, 2018 District 9 Basketball Schedule Powered by CBF Contracting, Inc.